I am still quilting my way through the stack of basted quilts that I showed you on my blog post the other day. I just finished this little flying geese quilt. If you are wondering what the name of the border pattern design is, it's called "Oh my gosh....I can't believe I've finished 3 things in a week!!!!!!" I started to hand quilt this one, but for some reason the seams were pressed in all different directions. So I ended up just doing some simple machine quilting. This quilt was something that I made up using some leftover charm squares. Cut 2 fabrics 2 1/2" X 4 1/2". The pink fabric is a charm square. Cut the charm square into 4 squares that measure 2 1/2". Place two of these squares onto the background fabrics as shown and sew diagonally. I pressed the squares so I would have some sort of line to sew on. You could also draw a line on the back side of the fabric for a guide. Press the pink fabric toward the corner. Now put the other pink square on the opposite corner and sew. And you've made two flying geese units. Here is my little quilt after it was washed, crinkled and poofed. I hope you are finding some time to stitch and enjoying your weekend. 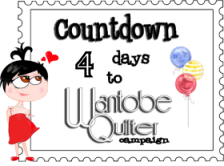 Are you a Wantobe Quilter????? 1. Send me an email at krugla@gmail.com and tell me you want to be signed up for the Wantobe Quilter campaign. Include your name and email address. 4. Go to the Stash Manicure blog and leave a comment Monday through Friday. This enters you in the drawing. If you put my name in the comment, I can win something, too. I think this is going to be a lot of fun, and I hope you join in. You only have until August 1 to sign up. I have a few quilt tops that I really want to finish. OK. Well, there's really more than a few. The photo isn't too clear, but if it looks like this is a laundry basket overflowing with quilt tops......well you're right. A few months ago I took everything out of this basket (and the other big Rubbermaid container full of quilt tops that I have) and took photos of each one. I was going to put every one of those photos on my blog under the UFO tab above but decided I couldn't live with the embarrassment. So there are a few photos there but most of the things that are in the basket are things you've never seen. These two little quilts are place mat size and are from the book, Little Quilts All Through the House by Alice Berg, Mary Ellen Von Holt, and Sylvia Johnson. That book is copyrighted 1993, so I imagine these two little quilts could be about that old. That really doesn't sound that bad until you do the math. I love making and starting new things, but I am going to try hard to keep up the finishing momentum. Hope you are all stitching just a little today. Thanks for stopping by!!! Quilts & Coffee....what could be better? It's been a good weekend so far. Last week I found a comment on my blog from Debbie at Happy Little Cottage blog. We exchanged a few emails, and I went over to her blog to pay a visit. I enjoyed looking at her quilts, but as I scrolled down the page she had a post about making iced coffee. I followed the link to the recipe to give it a try, and it is just as wonderful as she told me it was, and it's super easy. I have another batch "brewing" right now. I add some milk and then a big splash of cream. I think I'm addicted. Thanks Debbie! My friend, Val, from Canada made the cute coffee mat for me. Mix 1/3 cup of ground coffee with 1 1/2 cups water. Let sit overnight or for about 12 hours. Then strain through 2 coffee filters. Pour over ice and add milk, cream, sugar or whatever you like. Debbie tells me that it is really good with sweetened condensed milk added. There's no cooking.....you just stir. What could be easier? I basted several quilts in the last couple of days. In fact I basted until I ran out of curved safety pins. And, then I thread basted a couple of small quilts. 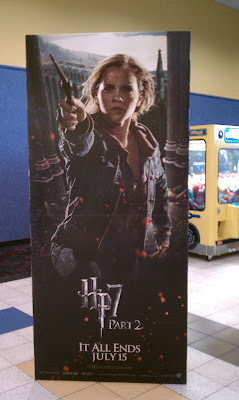 We also saw the final installment of the Harry Potter movie. A good movie, and I really enjoyed seeing the ending. I love all the special effects. I hope you are all having a good weekend and doing something you enjoy. I won a giveaway over on Vicky's blog LA Quilter. She gave me a $50 gift certificate to Fat Quarter Shop. The giveaway was awhile ago, but I wanted to show you what I bought and how I plan to use some of it. With the Flurry charm pack I want to do a smaller wall hanging size of this quilt. The directions for this quilt are available as a free download from Fat Quarter Shop. I saw this quilt along with the entire line of fabrics at my local quilt shop. The Bella solids are 1930s colors. I wanted these to work on a project that I've already started. After I cut pieces from my Kaffe Fassett fabrics to use in my Hearts and Flowers applique' quilt, I keep the larger scraps. I saw this little basket pattern in one of the Quiltmania magazines and decided these baskets would be a good way to use those scraps. These baskets are 2 inches high. This pack of Christmas fabrics by Riley Blake is called Christmas Candy and is a stacker. There are 22 charm squares in a stacker. The stripe will be used for binding. I wanted the Christmas candy fabrics to use with some other fabrics with Christmas candy that have been in my stash. I've already cut those fabrics into 5" squares. These pieces are from Just Wing It by Momo for Moda. I have a layer cake of that line so the solids will go into the quilt and the floral will be used for backing. More on that quilt in another post. Thanks so much to Vicky for such a generous giveaway. I had lots of fun spending the gift certificate and will have just as much fun sewing up all of these great fabrics. Please go over to Vicky's blog and say hello; she is having another giveaway that ends this Saturday morning. I also hope you will go on over to Fat Quarter Shop and spend some time there. Besides lots of beautiful fabrics, there are free patterns to download and also photos and information on fabric lines that are coming out soon. Thanks for stopping by to visit. I hope you are having a good day and doing a little bit of sewing! Yesterday I worked on my Dresden Plate quilt. In my post of March 13, 2011, I talked about the block that I made. I have had my Dresden ruler for quite a few years and had never made anything with it....not even one wedge. While visiting Anne Marie's blog awhile before that, she posted that she had bought the ruler and showed the fabrics she was going to use. I left a comment on her blog and told her about my template and that it was still in the package, and she challenged me to make something with my template. Then I decided to cut into my Fresh Flowers fabrics by Deb Strain for Moda, and I made this block and then and put them all away. I don't have enough of any of the fabrics shown to do the inner or outer borders so I'll have to be creative or buy more fabric. Full disclosure: Except for the center block, the fan blades are basted in there and are not applique'd to the background. I will hand applique' because it looks better than my machine applique'. Thank you Anne Marie for motivating me to do something with this template. I have always loved Dresden plate quilts, I had no idea how easy these blocks were to make until you challenged me. Go over to www.patchworktimes.com to check out what everyone else has on their design walls this week. Thanks for stopping by my blog today for a visit. Hello to all of my new followers that found me through my post over on Stash Manicure earlier this week. And, welcome to all of you that have been following here for awhile. It has been so nice meeting all of you. A couple of months ago I was browsing in one of our JoAnn Fabrics stores here in town and ran into a friend I hadn't seen in quite awhile. We had a nice visit, and it turns out that she also has a blog. We have been following each others sewing adventures since that day. One day I went to Steph's blog and found a crocheted rug she had made. I enlarged the photo of this rug as large as I possibly could and just sat there staring at it. As I read her post I couldn't believe it. She had crocheted her rug with 1" strips of fabric using a size P hook. I was puzzled because I didn't see any knots or pieces of fabric sticking up anywhere, so I wrote Steph. She works at one of our local quilt shops here, and she told me to come up and bring my hook and some strips and she would show me how she joins her strips and help me get started. Here is another one that I started. And, then we started a third one. I like to crochet, but after working with yarn this is pretty hard on the hands and not nearly as fast as I'd first thought, but I just love the way this looks. So I approached my daughter with this new project in the style of Tom Sawyer thinking she would want to do this, but she wasn't having any of it. I really do love Steph's rug and hope to finish one of these some day. Then I was looking through my photos on the computer and found this. I think this looks like a pretty neat rug, but where is it? As I kept going through photos I found this. That rug is the bottom of this crocheted bag. It's finished all but sewing the handles on. They are stuffed inside the bag along with some cute buttons. The bag is made from crochet cotton. Today I spent time outside in my flowers. I have wanted to put a big pot of flowers in between my garage doors for awhile now. So today I found a nice pot and it's late enough in the planting season that the flowers that are left in the stores are priced reasonably. So that all seemed to take up most of today. I forgot to take a photo of that pot, but these are some red day lillies that I have planted out back. The stella de oro variety (the yellow ones) of perennial day lillies grow so easily here, that it is kind of unusual to see them in a different color. I really have been doing some quilt things, but I can't show them. I worked on one round robin and mailed it to the next person on the list. Then the next quilt that I am to work on arrived, and I love the design and fabrics so much that I started working on it right away. Thanks for stopping by for a visit. I hope you are all finding some time to stitch today. I'm A Guest Blogger at Stash Manicure Today!! I'm so excited that Madame Samm asked me to come over to Stash Manicure and do a guest post today. My post is a tutorial about paper piecing. I must admit that I was a bit nervous. I've paper pieced for a long time, and it is honestly easier to do the actual paper piecing than it is to try and explain it. I included lots of step by step photos in the post as well as photos of some of my quilts that I've paper pieced. I hope you'll go on over to Stash Manicure and check out my post today and leave a comment. My goal for the last half of 2011 is to try and finish one UFO each month and to put together some of my blocks that are either from swaps that I've been in or others that I've made and for whatever reason have never become a quilt. Here is what I have on my design wall this morning. These blocks will finish at 3 inches and are from a swap that I was in with several friends that I retreat with twice a year. Our group consisted of either six or seven, and we each chose 6 different blocks and made one for each swap member. So every 6 months I ended up with either 36 or 42 blocks, all different. The only rules we had were that the blocks had to finish at 3". There are some holiday and seasonal blocks. There are traditional pieced blocks and some applique'. I love these little blocks: there are several cat blocks, an American flag, a grandmothers flower garden block, and a pumpkin. This is going to be a busy quilt. With an alternate block the quilt will measure around 57" X 66" without borders. I think I need an alternate block to give your eye a place to rest. What do you think? Would you just use a solid block or a pieced block? What alternate block would you use? You can go over to Judy's blog www.patchworktimes.com to see what others have up on their design walls today. Thanks for visiting. I hope you are having a nice day and finding some time to do some stitching! 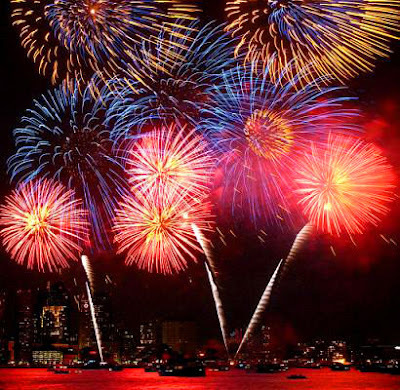 We had a wonderful July 4th weekend with our children here for a visit. We did a lot of visiting, had a barbecue with lots of good food, played cards, and watched a movie. Last night after everyone had gone home, I sat out on the deck and sewed a few more yo-yos. Later in the evening, I did my usual evening blog reading. I saw some gorgeous patriotic quilts, table runners and place mats. 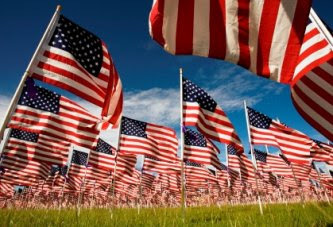 I looked around here and wondered where all of my patriotic quilts were. I remembered a flag I made years ago. This morning I looked, and there they were still in the UFO basket. This is from one of the Little Quilts books. I know this one is a real oldie but goodie. I think I was just beginning to quilt when I made this. You can see some of the basting stitches still in this one. It is the size of a place mat - maybe 14" X 18". Here is another little quilt made from the same pattern. This one is quilted, and the binding is even sewn on. And, here is a patriotic quilt top. These were second Saturday sampler blocks from one of our quilt shops. If you took your finished block back to the shop on the second Saturday of the month, the next month's block kit was free. Of course, there were also fat quarters for sale that coordinated with the original block. I made all 36 blocks that year. One of the blocks even has the Pledge of Allegiance. This is one of my favorite blocks with a bit of the story of the moon landing in 1969. I used the leftovers from the blocks to make these braid borders, but I think the quilt has enough going on without adding these busy borders. I think I'll square these strips and use the solid blue and make a strip quilt instead. This morning I also remembered these patriotic cupcake papers and the little flag decorations for the cupcakes. I know I'm a day late remembering all of these things, but the good news is that I've got 364 days to get ready for next year. To all who celebrate, Happy July 4th weekend.